Thirteen-year-old Kasey Madrid finally has the freedom she's always wanted. Instead of putting up with sitters or camps, she can spend the summer home alone in their "new" house. Never mind that the house is a creepy old place built in the nineteenth century. The creep factor skyrockets when Kasey meets a nineteenth-century girl named Lizzie Bellows in the basement. It takes some time for Lizzie to convince Kasey she's not a ghost, though neither girl understands why they can see each other when they live 120 years apart. The difference in their worlds doesn't stop the two from becoming fast friends. Lizzie's life isn't easy though. In her time, her parents died in a fire many believe Lizzie started herself. As the summer passes and Kasey learns more about her own past, she is shocked to discover Lizzie is part of a terrible Madrid family secret. It's up to Kasey to go back to Lizzie's world to unlock the secret and clear Lizzie's name. First of all I would like to thank Mr. Clark for sending me this book for review. When I first heard from Mr. Clark about this book I was unsure about whether or not it was something I would enjoy. I have to say that I was pleasantly surprised by what I read. 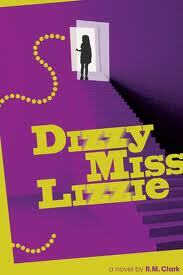 Dizzy Miss Lizzie is a very well written book. The characters are fun to follow and easy to relate with. Kasey is your typical inquisitive 13 year old and Paula plays the perfect role of best friend. When the book first started I was kind of confused about where the plot was going and what the point of the book was. It didn't take me long to get into it though and from there it was smooth sailing plot wise. It had a nice little touch of mystery to it that I enjoyed. It wasn't too in depth of a plot either, which is good for the age group this book is written for. The character development was good and not over done, which is important for a shorter novel. I thought Mr. Clark did a wonderful job of crafting all aspects of this book. I was curious as to how Kasey would break the mysterious curse and also by what her grandmother had to do with everything. If you are looking for an entertaining, quick read then this is the book for you. I would also recommend this book to any reader, regardless of gender. Sometimes people will look at a title or a cover and immediately write a book off (no pun intended). Please don't let that be the case with this book. It is well worth the read.